A damaged coach is moved from the wreckage Saturday after a deadly collision near Kanpur, India. New Delhi, India (CNN) -- Ten passengers died in a train collision blamed on fog and a power failure in northern India on Saturday, rail officials said. The accident happened near the city of Kanpur when a train rear-ended another, said railway spokesman Anil Saxena. At least 42 people were injured and 19 were in critical condition, Saxena said. Another train collision happened in the same state of Uttar Pradesh in the space of about an hour, Saxena said, but no one was injured. Thick winter fog enveloped parts of northern India on Saturday. There also were power outages in the region. "Fog is one of the main culprits," Saxena said. 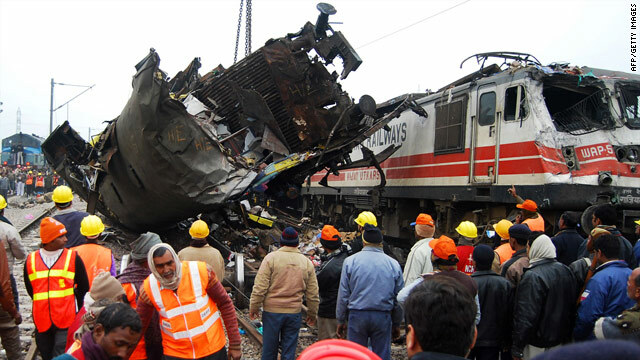 The Kanpur wreck occurred after a power outage stopped the first train, Saxena said. A second train rammed into it, apparently because of poor visibility. India's massive rail network is marred by a poor safety record. The country had 117 train accidents in 2008-09, according to rail officials. Of those, 80 were blamed on staff failures. In 2007-08, India recorded 194 train crashes, officials said. The rail system is testing anti-collision devices on trains in the country's remote northeast, Saxena said.